On November 21, 1996, a search team from the private research firm Intersal, Inc., operating under a permit from the N.C. Department of Natural and Cultural Resources found a cluster of cannon and anchors on the seabed near historic Beaufort Inlet. Several diagnostic artifacts were recovered from the site, designated North Carolina shipwreck site 31CR314, including a bronze bell dated 1705, a sounding weight, an English blunderbuss barrel, a lead cannon apron and two cannonballs. These early 18th century artifacts, nine cannon tubes, and two large anchors led the discoverers to conclude that this was the wreckage of the pirate Blackbeard’s flagship, Queen Anne’s Revenge (QAR). The site was listed on the National Register of Historic Places in 2004. The first dive led by the Underwater Archaeology Branch (UAB) in the fall of 1997 allowed the archaeologists to examine completely the shipwreck site and debris field, and determine the size and orientation of the site. Two cannons, four cannonballs, a pewter platter, pottery fragments and other artifacts were recovered. As of 2015, 24 cannons had been raised from the wreck site. 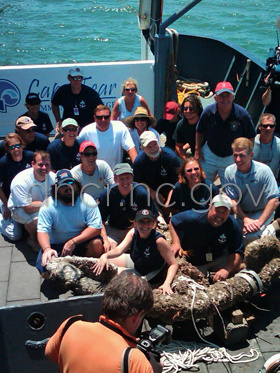 A small anchor, called a grapnel, was recovered in 2009 and a nearly 12 foot long anchor was recovered in 2011. To learn how you can see items from the wreck in person, click the button below.